Global warming may be ratcheting up the odds for violence at the local, regional, and international scales, from inner-city America to the arid plains of Africa, according to a comprehensive new study published Thursday. The study, published in the journal Science, concludes that climate events from heat waves to droughts and floods have strong links to violent conflicts, helping to explain patterns of crime, civil wars, and even the collapse of some ancient civilizations. The study draws on a broad body of evidence from fields as disparate as archaeology and political science that show a causal and often substantial connection between climate and those events. 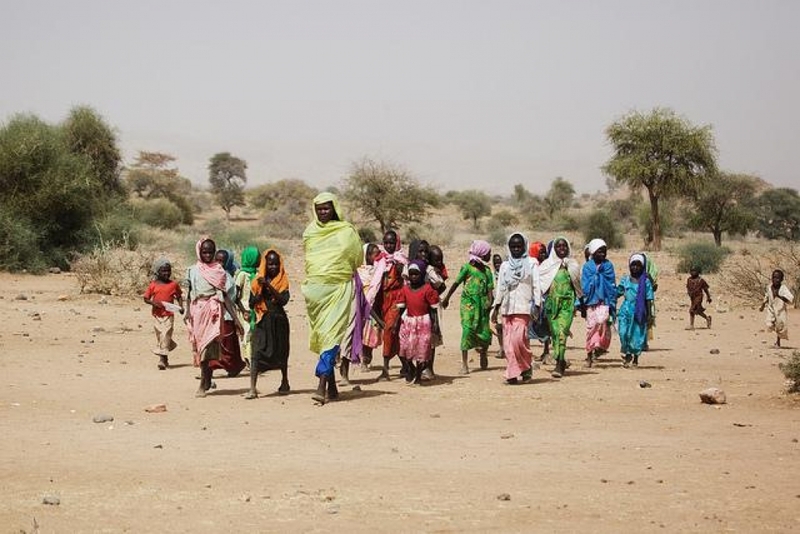 A Sudanese woman and children are pictured in Fanga Suk in East Jebel Marra, South Darfur. Credit: United Nations Photo by Olivier Chassot. The report, which took a sweeping view of 60 previously published studies on climate and conflict, found that the size of climate’s influence on conflict is larger than most previous studies had estimated, although the authors cautioned that climate is not necessarily the biggest factor driving violence in most situations. Written by researchers at Princeton University and the University of California at Berkeley, the study found that when the climate deviates far from average conditions, the risk of many types of conflict increases. To put it more technically, the study found that for each one standard deviation change in the climate toward warmer average temperatures or more extreme rainfall, the median estimate of the frequency of intergroup conflict — i.e. civil war — rises by 14 percent, while the frequency of interpersonal conflict increases by 4 percent. 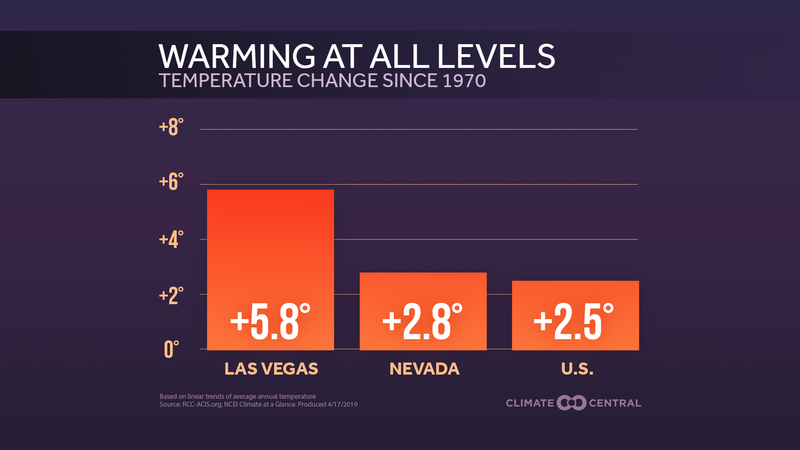 “For a sense of scale, this kind of temperature change is roughly equal to warming an African country by 0.6°F for an entire year, or warming a U.S. county by 5°F for a given month. These are moderate changes, but they have a sizable impact on societies,” said study co-author Marshall Burke of U.C. Berkeley, in a press release. Given that climate projections show that many parts of the world are expected to at least double that amount of warming by 2050, the findings strongly suggest that barring other mitigating factors, a warmer world will also be a more violent one. Zambian peacekeepers from the United Nations Mission in Sudan (UNMIS) patrol streets lined with looted items awaiting collection in Abyei, the main town of the disputed Abyei area on the border of Sudan and newly independent South Sudan. Credit: United Nations Photo by Stuart Price. 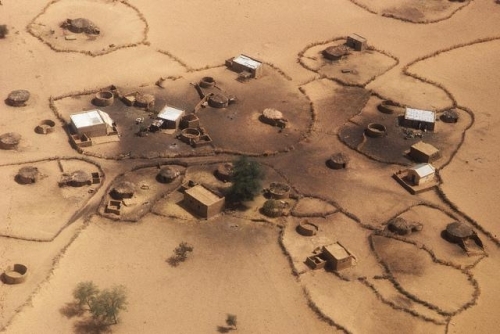 There are numerous recent conflicts that studies have linked to climate extremes, including the Arab Spring that began two years ago, genocide in Darfur, and the ongoing Syrian civil war. In the case of Syria, for example, a major drought and sharp spike in food prices, along with reduced access to water and power supplies preceded the uprising against the regime of president Bashar Al-Assad, and similar climate-related food price spikes played out in Egypt and Tunisia prior to the ouster of longtime governments in those countries. Lack of consistent access to water may contribute to more conflicts in the future, with increasingly strained water resources in coming decades due to burgeoning populations and drought. Climate studies show that drought is projected to increase in frequency and severity in some parts of the world that are experiencing high rates of population growth, such as the Middle East and parts of Africa. The research is the first to reexamine the available evidence on climate and conflict, which has at times been a contentious subject within the scientific community. The results dramatically depart from prior research that said the relationship between global warming and conflict is contradictory and inconclusive. The Cal-Berkeley team found that all 27 studies dealing with modern societies found a relationship between higher temperatures and greater violence. Experts in the field who were not involved in the study said its findings are groundbreaking. “I think it’s a path-breaking study that lays to rest a lot of the earlier, slightly misinformed, debate and confusion,” said Marc Levy, deputy director of the International Earth Science Information Network at Columbia University. Levy said the study shows that climate is clearly a driver of violence, but not the main driver in most cases, given the many other contributing factors to conflict, from ethnic rivalries to economic development and political repression. He said previous studies that had looked at individual conflicts and individual climate factors resulted in a “cacophony” of seemingly disparate results. 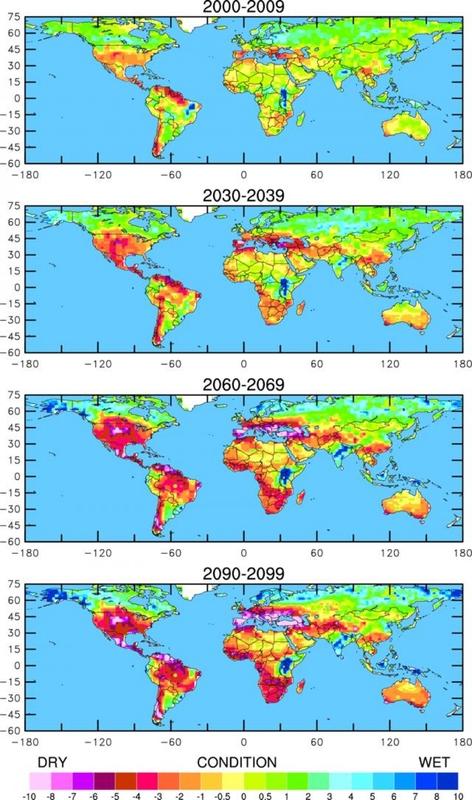 These four maps illustrate the increased potential for future drought worldwide over the decades indicated, based on current projections of future greenhouse gas emissions. The maps use a common measure, the Palmer Drought Severity Index, which assigns positive numbers when conditions are unusually wet for a particular region, and negative numbers when conditions are unusually dry. Click image to enlarge. Credit: NCAR. 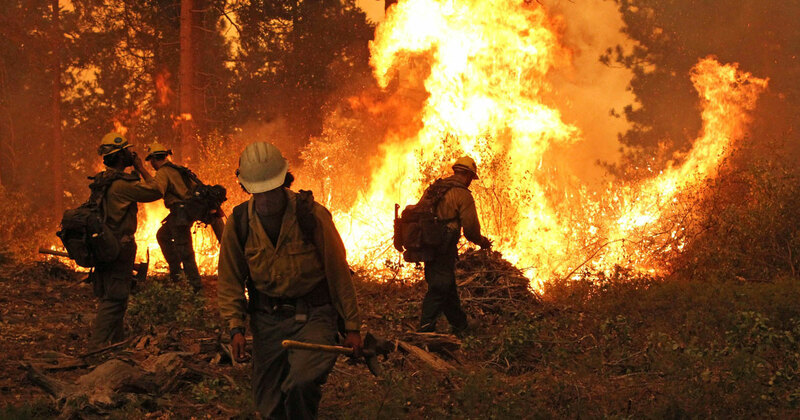 “It’s really, really difficult to find a smoking gun, to find a climate stress in a conflict and say definitively that in the absence of climate stress this conflict wouldn’t have occurred,” he said in an interview. Levy said the study demonstrates where the social and physical science communities are headed on the climate and conflict nexus, with more researchers becoming convinced that the evidence is far stronger than it was just a few years ago. “Many more people are falling into the camp that the evidence is definitive,” Levy said. Thomas Homer-Dixon, a professor at the University of Waterloo in Canada, said the study presents a compelling case for a robust link between climatic stress and violence, while being careful to acknowledge that climate change is but one of many factors that can increase the likelihood of violence. “The paper’s conclusions are dramatic in terms of their implications for policy and for humankind more generally, but they’re not sensationally stated,” Homer-Dixon said in an email conversation. “The paper is well-caveated, with clear acknowledgments of areas where future research is necessary. Not everyone is convinced by the new research, however. “I struggle to see how the authors can claim a remarkable convergence of quantitative evidence when one-third of their civil conflict models produce a climate effect statistically indistinguishable from zero, and several other models disagree on the direction of a possible climate effect,” said Halvard Buhaug, research director at the Peace Research Institute in Oslo whose work has cast doubt on ties between climate extremes and conflict. “Surprisingly, the authors provide no examples of real conflicts that plausibly were affected by climate extremes that could serve to validate their conclusion. 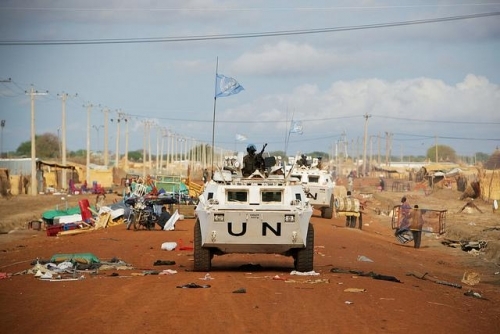 For these and other reasons, this study fails to provide new insight into how and under what conditions climate might affect violent conflict,” he said in an email conversation. The new study is what is known as a “meta analysis,” and it took the data from numerous prior studies and examined them collectively using state of the art statistical methods that were unavailable to researchers until relatively recently, thereby drawing conclusions from a far larger dataset than the individual studies themselves. In total, the research contains the results of a comprehensive review of the available data put forward by 60 prior studies of climate from 190 researchers in various disciplines, including data on violence dating from 10,000 B.C.E. to the present day, extending across all regions of the globe. Reflecting the growth of research on this topic in recent years, 78 percent of the studies were published since 2009. The study incorporated findings from research on domestic violence, street crime, rioting, civil war, all the way to the collapse of entire civilizations. Next, in order to reduce the margin of error, the researchers pooled the standardized data together in a way that is similar to how a political pollster might average a group of polls to accurately predict the outcome of a presidential election, rather than relying on just one or two polls to get a snapshot of the race. These methods allowed the researchers to analyze separate data sets that would otherwise make for “apples to oranges” comparisons. A deserted drought-stricken village in Mauritania seen in 2011.
Credit: United Nations Photo by John Isaac. Among climate change-related factors, the study found that temperature has a larger effect on violence, particularly intergroup violence, than precipitation, although both clearly influence the odds of violence. In order to prevent such a bleak future, researchers and policymakers face a daunting task, since knowing that climate change affects violence is not enough to create better early warning systems or develop violence-prevention strategies. To devise successful strategies that reduce the risk of future violence, scientists need to determine the causal pathways through which climate influences conflict. For example, it could be through economic factors, with a drought reducing farmers’ income and, at the same time, increasing food prices that further stress society. Policymakers also need to put in place tools to anticipate and prevent conflict. “We’re in the same position that medical researchers were in during the 1930s: they could find clear statistical evidence that smoking tobacco was a proximate cause of lung cancer, but they couldn’t explain why until many years later. In the same way, we can show that climatic events cause conflict, but we can’t yet say exactly why,” said lead author Solomon Hsiang of Princeton University (now at U.C. Berkeley), in a press release. The evidence regarding the link between climate change and conflict is solid enough to have motivated the U.S. national security establishment, spurring research projects at the CIA, the Defense Advanced Research Projects Agency, and other agencies. The 2010 Quadrennial Defense Review, and the 2010 National Security Strategy identified climate change as a threat to U.S. national security, in part, because of its potential to foment political instability in strategically important regions, such as the Middle East. A CIA-funded study published in 2012 found that climate extremes, such as droughts and heat waves, are already exacerbating tensions in parts of the world. 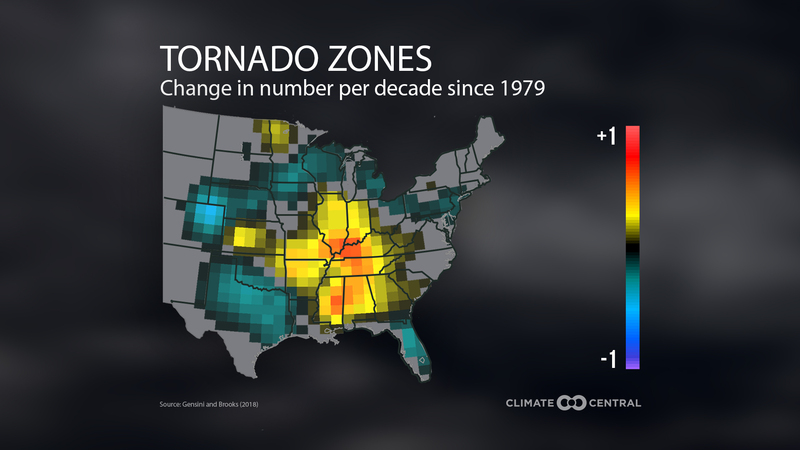 A promising avenue for early warning systems may be through the use of big data. Those approaches would combine various social indicators, such as the average income of a country, with environmental monitoring data, such as satellite imagery showing vegetation health, to detect areas at higher risk of climate change-related violence. Some of those efforts are already underway. A Pentagon-sponsored research group that Columbia’s Levy is advising is trying to combine social media data mining with remote sensing data from satellites and other tools to identify potential pressures on social stability in the so-called “megacities” of the world, with populations of greater than 10 million.